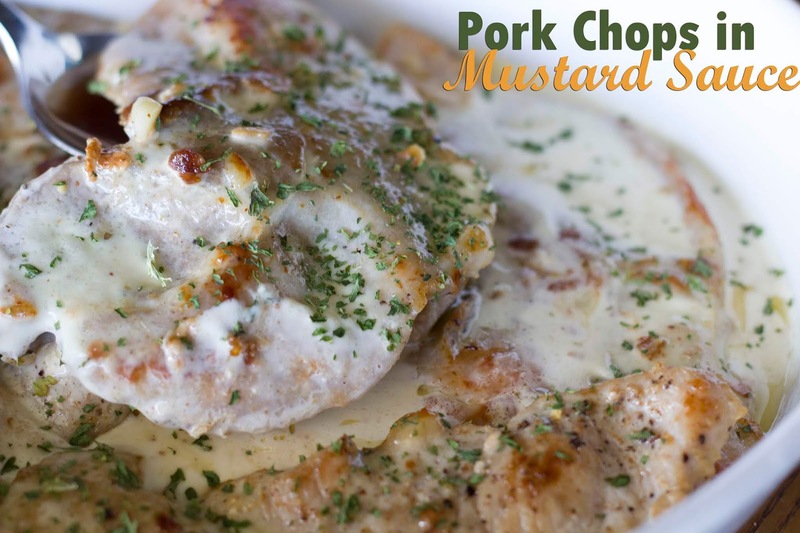 You guys, I have one of the tastiest pork recipes for you all. I love pork but I get a little tired of making it the same way, over and over again. I don't know, I just find that pork is a bit harder to find good recipes for, and that's probably just me, but anyway, in my attempt to find a different way to fix pork, I turned to my old Teleculinaria Portuguese Cooking Magazine. The Teleculinaria magazine is a really old one but is always filled with the yummiest recipes. Back to the pork. No joke, this was one of the tastiest meals we've had in a while, I paired with some Pressure Cooker Twice Baked Potatoes and a salad, and everyone raved. Season the chops with the salt and pepper and some fresh garlic. Set aside and let sit for about 30 minutes. Fry the chops in some butter until nicely browned and completely cooked through. Transfer to a baking dish to keep warm. In a small bowl mix the heavy cream and the mustard. In the skilled you fried the chops in, scrape up the bits, add the heavy cream and mustard mixture, and mix well. Let it come to a boil so that it thickens a bit, then pour over the chops. Sprinkle on some parsley and serve immediately. I have a lot of kitchen gadgets and appliances and enjoy trying them all out. I can't really say that any of the appliances I have bought, have been a disappointment, but I can for sure say that some have become my favorite to use and I try to use them as much as I can, sometimes daily. My pressure cooker is one of those. Not just for it's convenience, but I love putting it to the test and making things in it that I would never have thought of doing. Last week I made some delicious pork chops (recipe will be up after this one), and to go with them I wanted twice baked potatoes, but it was a super busy day and by the time I got around to dinner prepping, I realized that I wouldn't have an hour or more to wait for the potatoes to bake in the oven. Obviously, I turned to the pressure cooker, looked through my user manual, searched a few online tips and tricks and went for it. Guys???? They came out so good that I will never bake them in the oven again. 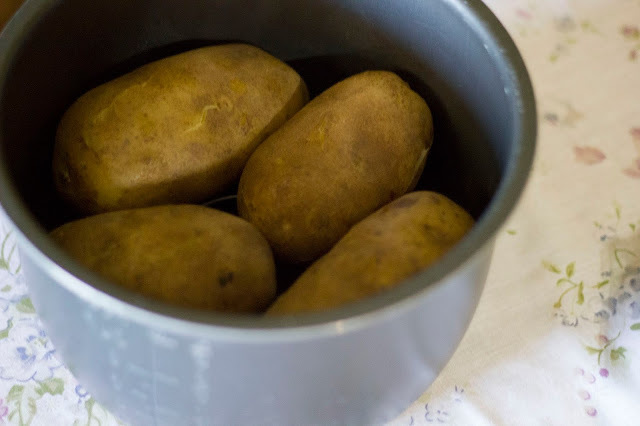 Let me tell you real quick how to make these delicious potatoes. Wash the potatoes well and then poke them a few times with a fork or knife. In the meantime, placeyour trivet inside the pressure cooker, you don't want the potatoes to touch the bottom of the pan. Add 2 cups of water, close the lid, making sure the valve is set to seal. Press the Manual Button for 25 minutes on High pressure. When the potatoes are done cooking, place a dishtowel over the release valve. I always do this because sometimes it sputters water everywhere. Do a quick release of the valve and then remove the potatoes carefully. I used tongs for this. 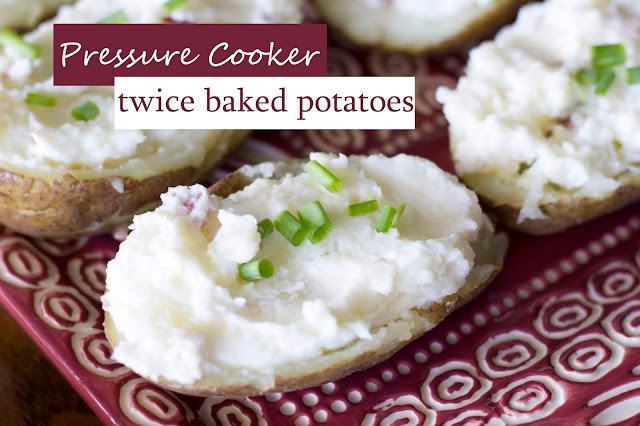 Let the potatoes cool just enough so you can handle them, then slice them in half. Using a spoon remove the inside into a bowl. Now for the filling, you can make your baked potatoes however you prefer. Some people do a simple mash with milk, salt, pepper and butter. Some people use mayonnaise or sour cream, whatever you want. I use butter, salt and pepper, some garlic powder and a little bit of sour cream to make them nice and creamy. I also like to add bacon bits and cheese to the mixture. Scoop the filling back into the potatoes, sprinkle on some green onions, and you're done. If you wish, you can also sprinkle on some shredded cheese and pop them under the broiler to melt the cheese. Today I'm bringing you a recipe that is sure to become a hit in your home. 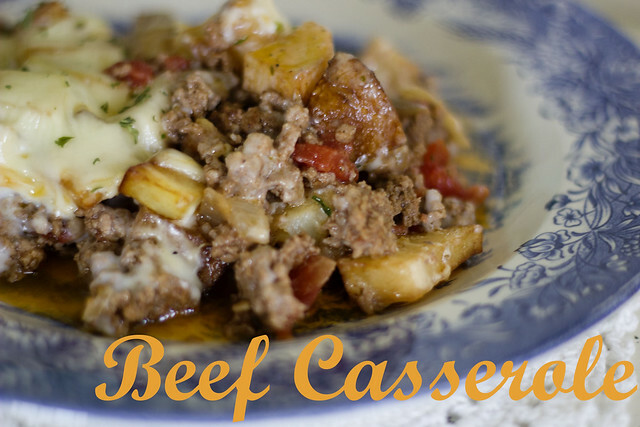 Imagine if you will a Cottage Pie, but instead of mashed potatoes, you use cubed fried potatoes and a delicious white bechamel sauce that will make it all yummy and creamy. I've been trying to get back into cooking and baking on a daily schedule, and most importantly coming up with and trying new recipes. I always menu plan but it gets a bit tiring making the same things over and over, and it feels like the past year that is what I've done. So out come the old cookbooks for inspiration. I truly do hope you enjoy this one, as always if you try it, I would love for you to let me know in the comments below. In a pot, add a bit of olive oil (I eyeball, but it's about 1 tablespoon), add the diced onion, garlic and bay leaf. Cook over medium heat until onion is transparent. Add the ground beef and brown. Next, pour in the diced tomatoes with their juice, oregano and salt and pepper to taste. Simmer until the meat is cooked through and there is hardly any sauce left. In a separate saucepan, add 2 tablespoons of butter and cook over medium heat until melted, next add in 2 tablespoons of flour and stir vigorously and cook for just under a minute. Pour in milk, a little at a time, stirring with a whisk to make sure there are no lumps. I season it with a little salt, pepper and a dash of nutmeg. ( I always add nutmeg to my white sauce). Bring to the boil and stir constantly until the sauce thickens. Once meat and sauce are done, set them aside. Fry the cubed potatoes in oil until golden brown, drain on paper towels. In a casserole dish, pour in the meat mixture, remember to remove the bay leaf. Add the fried potatoes on top and spread them on evenly. 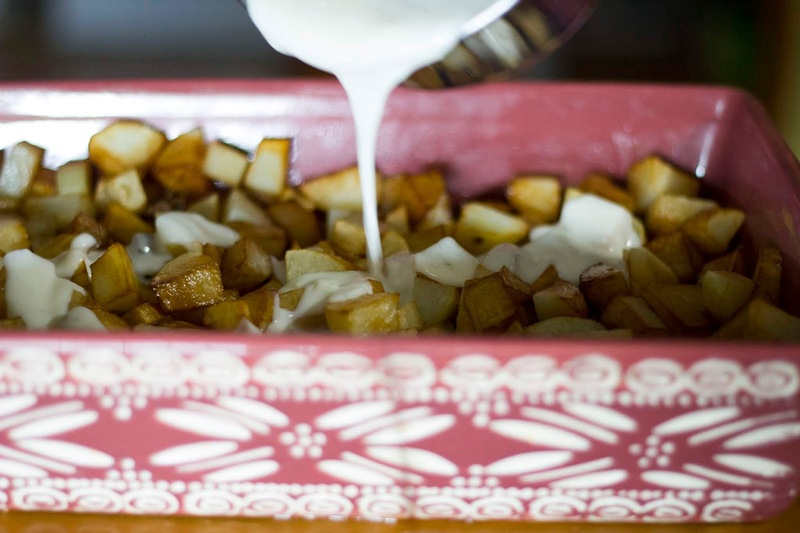 Pour over the potatoes the white bechamel sauce, then top with shredded cheese of your choosing. Bake in a 375 degree oven for 20 minutes. Sprinkle with Parsley and serve immediately!! !